At the top of the hill I found the High Street, preserving a truly ancient alignment which pre-dated even the Roman road to Colchester. I arrived at the end of town, most of the excitement and business happening east of the junction where I joined the road. Even here though, Brentwood felt busy and provincial - not like London at all, despite the regular pulse of red buses arriving from the west. The ancient market town had always been a crossroads - the pilgrim's road to the Thames and on to Canterbury crossed the great road to the east at a point marked by a chapel dedicated to St. Thomas Becket. The town was a staging post - approximately twenty miles from London, and thus a second chance for stagecoaches leaving the city to rest at one of its many inns. It still felt like a busy place of crossing, though on a gloomy Saturday morning there was little urgency to its business. It was hard to imagine this street being the site of the very first Poll Tax Riot in 1381. I turned west and headed along London Road - the long, straight route which overlaid the old track, and which was now lined with impressive town houses and occasional business premises. The road fell away surprisingly steeply, and a sudden glimpse of the horizon stopped me abruptly. Beyond the treetops, in the far distance, I could see a blur of clustered dark towers wavering in the cloudy gloom. Above them, still darker clouds churned and rolled towards me. It was raining on London, and the city glowered under the unquiet skies. I was walking to meet the storm as it moved eastwards. I had seen London from a distance before, and experienced similar shocks at its sudden imposition on a flat landscape - but this was different. An oddly apocalyptic vision of the city from this considerable distance was both welcome in quelling my anxiety and disconcerting in its offer of inclement walking weather. I pressed on and crossed a tiny brook, only perceptible by a rusty iron balustrade beside the street. The brook, shrouded in trees, meandered west towards the Weald Brook and the Ingrebourne. I felt a little more connected to things and relaxed into my surroundings as I passed the timbered gables of Marygreen Manor - a hotel which was once indirectly connected with Henry VIII via Henry Roper, Gentleman Pursuivant to Catherine of Aragon who lived here in 1514. The road levelled as Brentwood dwindled to edgeland businesses. The pavement gave out and I stomped along a grassy verge opposite the Holiday Inn. I could feel the nexus of main roads closing on my route, the traffic slowing and a string of red taillamps providing my approach lights for the junction ahead. 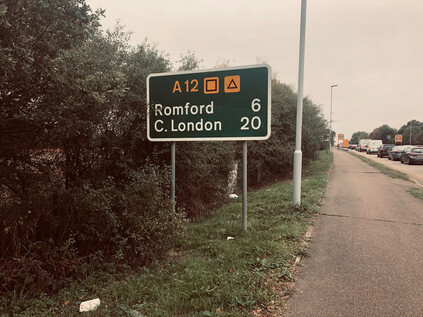 The brutality of the traffic was initially shocking - the A12 cannoned in from East Anglia, urging drivers who were glad to finally be travelling on decent, fast routes towards the more uncertain progress of the M25. The A12 continued, but it was a largely obsolete arterial which made an approach on London which few would choose willingly. Thus, once over the first rather tricky to cross southbound slip-road and under the wide concrete carriageways, I found my own exit a good deal less busy. The road ramped down towards the A12 which passed below, the footpath separated by a screen of hedges. I was walking a tightrope here: the open fields to my left were in Essex and the road to my right was in London. The situation was resolved when I finally crossed the tiny, busily trickling River Ingrebourne just where the slip-road joined the main carriageway. It turned west into the thick greenery which bordered the road, and with it, I entered the London Borough of Havering near a tired and uninviting welcome sign. It was unceremonious and undetectable unless you were looking out for it. Perhaps unsurprisingly - the gravity here was weak. A few feet further ahead, the absurd vastness of London became clearer: I was still twenty miles from Central London. The clouds rolled towards me faster than the traffic on the opposite carriageway. The cars heading out of the city had their wipers working at full-speed and dripped a trail of rainwater. I felt the first, heavy drops of late summer rain begin to plop onto the coat I'd contemplated not wearing. My charmed period of dry, sunny summer walks was ending it seemed. There was a further watery omen too: I entered the edge-suburb of Harold Wood, walking beside the road on a run of tired, mostly shuttered shops called The Parade. As I crossed Harold Court Road, a busy link heading south with a distinct slope into the Ingrebourne Valley workmen were discharging filthy waste water from a manhole, pumping it out into the road where it formed a torrent of brown effluent rushing across my path. As I gingerly stepped out, unable to entirely avoid the sheet of water cascading along the tarmac, a workman cranked the pump up a notch and the pipe sputtered a fresh gulp of dun fluid towards me. I skipped the final few steps to safety, supposing I'd at least provided them with a giggle. I wasn't staying dry though, and as I pressed onwards the final gap in the clouds sealed shut ahead of me. I soldiered on as best I could. The road was a headache-inducing swish and screech, and navigating across the frequent minor streets joining the main route was tricky with the oversized hood of my coat occluding the view. Harold Wood gave way to the edges of Gidea Park and I encountered another walker at last: a middle-aged man skipped out of a nearby front-garden, casually unleashing an umbrella above him. Aside from this confident moment though, he appeared out of his element. He was unnerved by the road, recoiling from the passing cars and curiously checking along every possible side-street or footpath. When a crossing was necessary or a turning opened up, it appeared to be a difficult decision for him. So erratic and confused were his actions that I worried for a while that perhaps he had dementia and shouldn't be out here alone. I stayed close enough behind to maybe help if needed, but far enough away not to spook him. Eventually, he stopped in utter confusion near a side-street and pulled out his 'phone. As I passed him, overhearing his part of an exasperated conversation, things became clearer: his car was in for repairs, and he didn't know the way to his local garage on foot. Walking had defeated him. It felt likely to defeat me too though as I got progressively more and more sodden. I paused in a bus shelter near a retail park at Gallows Corner. I contemplated bunkering in the ubiquitous chain coffee outlet nearby until the storm had passed but reasoned that this wouldn't be anytime soon. The weather had set in for the day so I could choose to walk or give up. Of course I'd walk, and as I passed the modern boundary marker denoting the course of the Roman road into London, I realised I had to make a decision: did I want to pursue the graceful but isolated and exposed arc of Eastern Avenue, or should I perhaps take a leaf from the Roman playbook here and take the shorter, straighter route to civilisation? Whichever route I took would mean navigating a segment of this unforgiving junction where the A12 and the A127 met in an unholy tangle of testy Essex-bound traffic. 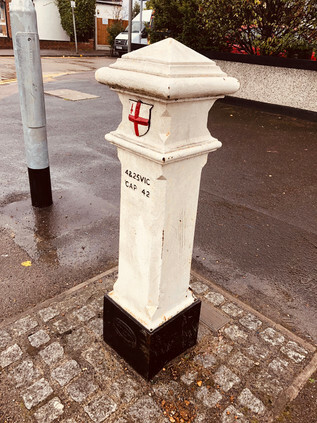 This spot has never been entirely quiet - even centuries back when the junction was a simple, lonely crossroads on the road to Colchester it had overlooked the gallows of the Liberty of Havering. The crossroads is the recorded burial place of numerous felons in the 16th and 17th centuries, and a jail for the condemned stood nearby on a site now occupied by a school. 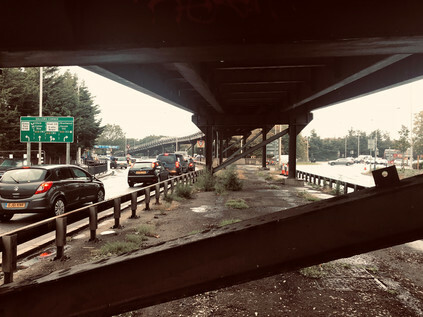 Nowadays, Gallows Corner was home to a chaotic circus of traffic, and since 1970 it had been spanned by a rickety and angular steel viaduct which carried through-traffic from the A12 to the A127 without the need to edge around the gyratory below. This temporary structure was notorious: driving it was far from a smooth affair, more akin to climbing steps as the bolted-together sections clanked and clambered over the roundabout below. From beneath, the much-refurbished structure looked stable enough but sounded entirely terrifying. The clatter and shudder of passing vehicles and the hissing of tyres on wet roadway sounded like the unquiet souls of the hanged protesting their fate. It was a grim spot, sandwiched between suburb and retail park, somewhere to pass through quickly and no longer designed to be visited on foot at all. I hurried onwards, my decision made - I'd take the old road from here. This was not a day to be far from civilisation. Free from the orbit of Gallows Corner, the suburb of Gidea Park stretched along the margins of the reassuringly named Main Road. The houses were spaciously spread with generous gardens and only where modern in-fill development had taken place did this feel like a traditionally cramped London suburb. Much of the development here was part of the Romford Garden Suburb, constructed around 1910 by a company formed by three Liberal members of Parliament: Herbert Raphael, Sir John Tudor Walters and Charles McCurdy. The cottages and houses were designed by competition, with many fine designs surviving as locally and Grade II listed properties which now fetch eyewatering prices at market. Later, in the 1930s the area gained a fine modern church - St. Michael and All Angels - and further modernist style homes including examples by Berthold Lubetkin's Tecton Group. My route through the suburb largely avoided these architectural gems, instead taking me along the main drag beside a parade of the normal takeaways and hairdressers but with a few more national names thrown in to convey its relative affluence. This was formerly Hare Street, a name shared by the hamlet which had once straddled the road to Romford but which had been absorbed wholesale into Gidea Park. The Great Eastern Railway arrived in 1910 at 'Squirrels Heath & Gidea Park' station - by 1913 the order of names had been swapped, and soon the current name was adopted. Hare Street and Squirrels Heath, harking back to a rural Essex past, were retired hamlets: no longer descriptive of these modern, outer suburbs on the ascent. A little further along Main Road, I encountered a notable depression with the parapets of a fine old brick bridge on each side. To the north of the road, an expanse of silvery water with a fountain spouting at its centre marked the former grounds of Gidea Hall, now known as Raphael Park. Gidea Hall enters the record around 1450 as a moated manor house in extensive grounds, but almost certainly replaced an earlier house on the same site. Rebuilt as a fine three-storey brick house by Sir John Eyles of the South Sea Company in 1720, the manor was sold to Richard Beynon who did much to improve the area, damming the brook which sprung from the grounds to create a broad pond and a watercourse later known as Black's Canal after the next owner, Alexander Black. 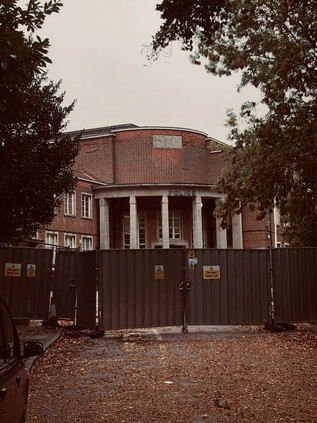 The estate was briefly in the hands of the Land Allotment Company but was finally purchased by Herbert Raphael and gifted to Romford Urban District Council in 1904. The park remains part of a vast green stripe through the Borough of Havering, a vision which Councillor Thomas England finally realised with his own donation of land at Rise Park, making it possible to take a country walk from Romford town centre to Havering-atte-Bower in the north. Today, Havering remains the London Borough with the most green space - partly due to its enviable borderland location, but also because of the enlightened thinking of benefactors like Raphael and England during its early urbanisation. Main Road continued as an attractive, tree-lined avenue as I approached Romford. I've arrived in Romford by numerous means and in diverse directions, but it was my first arrival on foot from the northeast. Once the pleasant avenue ended, it didn't present an edifying countenance from this particular angle. The old road splayed out into the arms of a ring road at a busy, churning roundabout flanked by towers of drab housing which sprouted from the roof of a large Asda store. Ahead, a modern take on a Market Hall with a neat clocktower presented a grander gateway than I'd expected. The building was primarily a fake: offices built to mimic civic space, and access was via a gloomy sequence of subways which decanted me under the pillared entrance to the market. I sheltered awhile wondering quite what to do: I could stop here, escape the rain and find hot coffee and shelter perhaps - or just head for the station. It felt wrong to abandon this walk so early and to forfeit the precious possibilities of these trips has always been a great fear of mine. I decided to press on - my route would stick close to the railway here, so I could abort the mission at various sensible points en route if needed. Besides, crossing Romford was a diversion - the market was colourful and surprisingly buoyant despite the weather conditions. People milled around, crossing to the stalls from the decidedly 1970s vintage storefronts along the margin of the broad market street which lay on the path of the old Roman road. I compared this to my recent crossing of Bexleyheath - where old Watling Street broadened into a market square too. There were manifold differences between the zones, not least the demographic and economic contrasts, but there was a defiant quality to the market. Still here after all these years, still busy, still a place where you could get a bargain - or of course be utterly fleeced. Some traditions of old Essex haven't changed at all. I crossed the busy shopping zone of South Street, the north-south thoroughfare which I'd used to approximate the course of the River Rom when I last walked through Romford. Beyond that, my route took a turn for the drab with closed businesses and dingy, condensation-shrouded cafés lining the pavement. The whitewashed brick chimney of The Brewery towered over the decaying High Street: once the site of Ind Coope's Star Brewery - home of John Bull Bitter. The shopping and leisure centre opened on the site in 2001 and rode out the recession remarkably effectively, while the neighbouring business had fared less well it seems. I escaped from Romford via another complex of subways which resurfaced on London Road, beside a long and rather depressing run of used car dealerships and expired pubs. 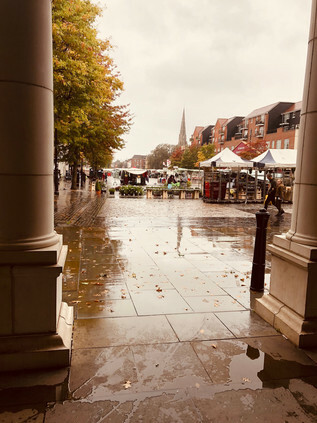 I trudged on through the suburban hinterlands west of Romford, doubting my resolve to carry on and rather wishing I'd taken the easier option back at the Market Square. However, rather unexpectedly up ahead there was a change in the sky: the rolling black clouds brightened to a bruised yellow and the rain seemed to slow a little. To the north, the buildings petered out and there was open farmland to be seen. I hadn't expected this - one of the uncanny gaps in the fringe of London where it appears a bite has been taken out of the boundary. The land to the north, while peppered with quarries and golf courses, represented another unbroken run of open land which reached out beyond the final suburban edges of Collier Row into Essex. I could see traffic zipping along the A12 at the furthest extent of the field, and reasoned that had I stuck to my route I'd be slopping miserably along beside it too. I took some solace from the brightening sky and tucked my chin into my coat to walk on. A little way further ahead I passed a Coal Duty Post - the harbingers of the city which I've found repeatedly along these eastern edges. Usually they are encouraging pointers that I'm on the right track - but this one seemed to mock me. I was barely over the threshold of London. At the treacherous crossroads where Whalebone Lane crossed the road, I waited uncertainly for the lights to change. Traffic nudged and harried, drivers impatiently sounding horns and veering into others space. I crossed in a peloton of pedestrians, huddled for safety. I'd passed through Chadwell Heath before and didn't look up - there was nothing new to see, and the rain had returned with a vengeance. It was time to look for an ending which wasn't entirely a defeat. I slogged on through the retail park borderlands of Goodmayes, none the better for the drab grey sky and thorough drenching it was receiving. Every crossing of a side-road became a chore as I needed to remove my hood and get drenched again, or to crane my neck awkwardly and suffer much reduced peripheral vision. I didn't trust the impatient drivers in these conditions and it made for nervous, unpleasant progress. I noted with some surprise that I was approaching ten miles of walking since I set off from Brentwood. It didn't seem possible - I felt like I had barely begun. Then again, I was exhausted from the effort of slithering along the drenched pavements and navigating the difficult crossings. As the mile ticked over, I saw the road ahead dividing to fork around the frontage of Seven Kings station. The little red-brick building dating from 1899 was like an oasis in the desert. I accepted this opportunity as a sign: it was time to admit the road, or at least the rain, had beaten me. I trudged down to the platforms, still building sites in preparation for Crossrail's now belated coming, and fell onto a new Class 345 train which soon entered the station bound for Liverpool Street. As I steamed and dripped my way into the city, I pondered how far my walk could have reasonably continued. Could I have made it to Stratford? Maybe even as far as the City? It was unlikely. Today had been stacked against me from the moment I saw the storm rolling west from the ridge of Brentwood, the brooding towers of the city glowering beneath it. My camera had barely left my pocket in the last hour - my progress was unrecorded. I hadn't managed to walk the broad, utopian arterial route of Eastern Avenue, nor had I quite conquered the scrappy but direct route the Roman's created toward Old Ford. I plodded from the train towards a welcome coffee when my train arrived at its terminus and figured that this walk had provided some perspective if nothing else: these trips were vitally important to me, and when they didn't work as planned I felt compromised but resolved to continue. I had unfinished business in the East once again, it seemed! You can find a few more pictures from this wet walk here.